CodeMix is a plugin that brings VS Code smarts to Eclipse, and gives you access to Code OSS extensions directly from Eclipse. With CodeMix, you get everything needed for a superior programming experience when working with HTML5 in Eclipse. Eclipse without CodeMix doesn’t include the tools you need for productive coding. Even if you download the various Eclipse plugins required to get these features, the result will not come close to the rich user experience that CodeMix delivers. CodeMix includes a Web extension pack that automatically downloads and manages everything you need for the optimal HTML5 and CSS3 coding experience. Suggestions appear as you type—you don’t need to specially invoke content assist. This is true for most CodeMix editors and once you get used to this, you won’t want to go back to the “Eclipse way”. 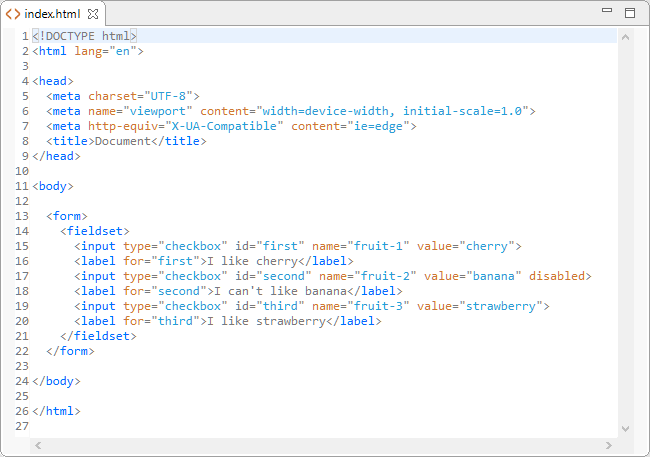 The CodeMix HTML editor stays on top of the HTML5 spec, ensuring you have high quality content assist for both elements and attributes. The documentation accompanying the suggestions is fairly detailed, which is especially handy when dealing with relatively uncommon and newer elements, like template for instance. Content assist for CSS class names is a huge timesaver! Thanks to the IntelliSense for CSS extension included in the CodeMix Web extension pack, you don’t need to jump to your style sheets and definitions to find the class you are looking for. And, it’s simple to tailor IntelliSense to meet your needs by selecting preferences in CodeMix. Eclipse has snippets/templates too, but few are defined out of the box, and plugins don’t add them either. CodeMix uses Bootstrap 4 snippets, and there are hundreds of extensions that contribute to Bootstrap. If you find yourself using other frameworks extensively, you’ll likely find snippet extensions for those frameworks too. Emmet is really handy when working with HTML. Emmet expressions save you quite a bit of typing, and with Emmet commands you can do even more. Emmet offers a wide variety of capabilities and settings that really speed up coding. Have you ever had a messed up layout because you didn’t close a tag? Or, maybe you used the same ID for more than one element? 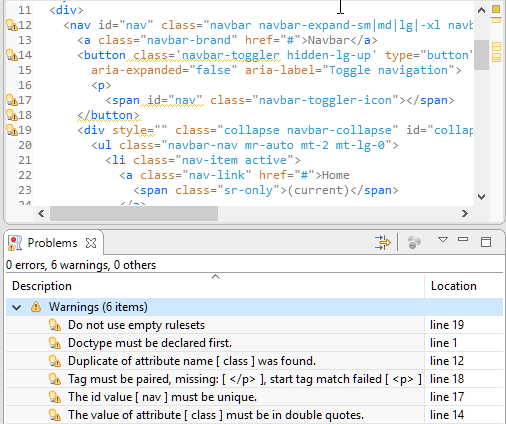 Eclipse doesn’t include built-in HTML validation, making it a real pain to locate errors like these. But thanks to the HTML Hint extension, you can now have configurable HTML validation in Eclipse with CodeMix. Take a look at how impressive formatting is with CodeMix. The first example shows what the Eclipse formatter can do—not too impressive. Now look at the second example showing the CodeMix experience—notice how clean and readable the code is. 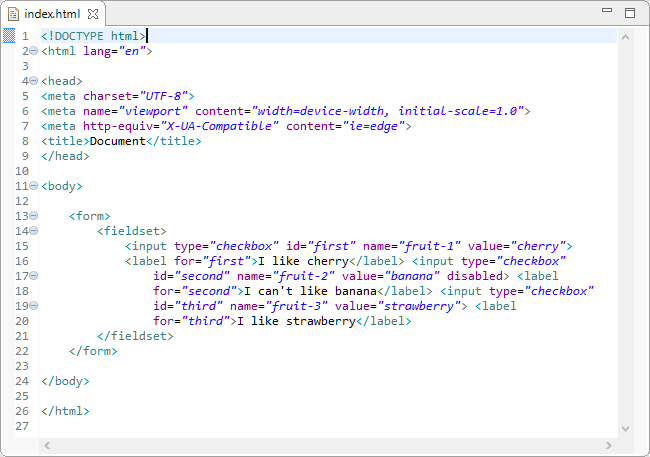 CodeMix formats HTML using the Beautify extension, which is included in the CodeMix Web extension pack. This extension offers a number of capabilities and settings for you to customize your experience. Play this quick video to learn more about HTML5 and CSS3 coding with CodeMix.